DoudouLinux was a Debian-based distribution targeting young children. Its goals are to make computer use as simple and pleasant as possible while also making information technology more accessible to all children on earth, without discrimination. 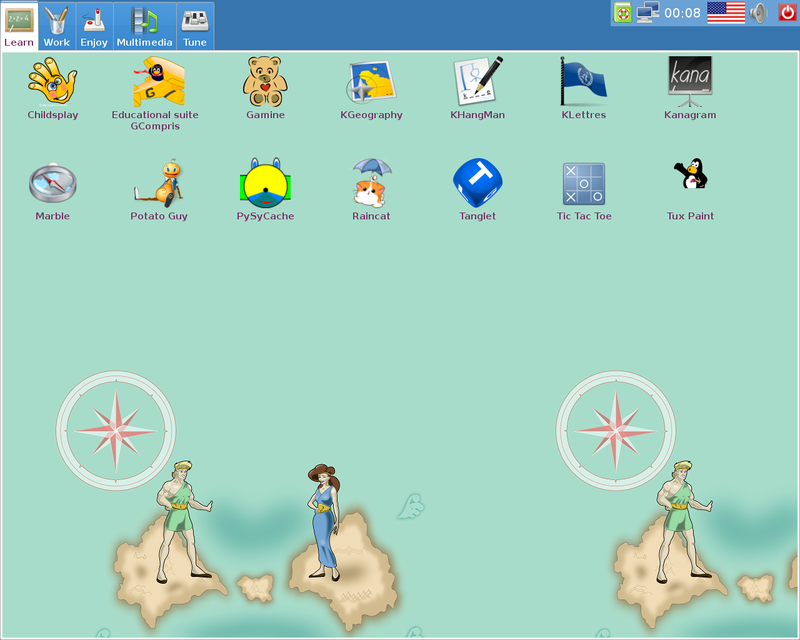 DoudouLinux uses a heavily customised LXDE desktop with a simple navigation system that offers links to about fifty applications for education, fun, work and multimedia tasks. Rate this project NuTyX is a French distribution built from Linux From Scratch and featuring the cards package manager. The latest development snapshot, NuTyX 9.0.93, features a new release of cards, version 2.3.93, and version 4.12.7 of the Linux kernel. "The NuTyX team is please to announce the 9.0.93 release of NuTyX. NuTyX 9.0.93 comes with Linux kernel 4.12.7, Linux LTS kernel 4.9.43, glibc 2.26, GCC 7.2.0, Binutils 2.29, Python 3.6.2, X.Org Server 1.19.3, Qt 5.9.1, MATE 1.18.0, Xfce 4.12.3, Firefox 55.0.1. More then 4,000 commits since the 9.0 version. A new 64-bit ISO image is available. Since all the collections are in compilation progress, they are no graphical interface available yet. ... Cards can install a package, a collection, a file or a mix of all three. It can also remove a family of packages - means a set of packages that start with a common name. If the found package is already installed, it will be printed in green in the result. New generic post-install actions are now automatically generated when needed. A new web site is covering the complete documentation of cards." Other updates include switching from version 6.3 of the GNU Compiler Collection to version 7.2 and updating the Firefox web browsers from 52 to 55. Further details and a list of key package upgrades can be found on the project's news page. Download from here: NuTyX_x86_64-9.0.93.iso (249MB, SHA256, torrent). NuTyX is a French Linux distribution (with multi-language support) built from Linux From Scratch and Beyond Linux From Scratch, with a custom package manager called "cards". The project has published NuTyX 11.0 which includes a complete re-build of the distribution and several package upgrades. "I'm very please to announce the new NuTyX 11 release. The NuTyX 11 is a complete recompilation of all the available binaries on NuTyX. Since everything has been recompiled, most of the packages have been update as well. The base of NuTyX comes with the new kernel LTS 4.19.28 and the very new kernel 5.0.3. The toolchain is completely rebuild around glibc 2.29, gcc 8.3.0 and binutils 2.32. The graphical server is now in xorg-server 1.20.4, the mesa lib in 18.3.4, GTK3 3.24.3, Qt 5.12.1. The Python 3.7.2 and 2.7.16 are updated as well. 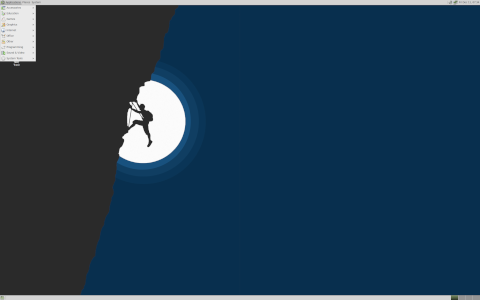 The MATE desktop environment comes in 1.22, the very last version as well. The KDE Plasma desktop in 5.15.3, Framework in 5.56.0 and applications in 18.12.3. Browsers Firefox in 65.0.2 and Chromium in 72.0.3626.121 (build by the Arch Linux team)." Further information can be found on the project's news page. The distribution is available in Fixed and Rolling editions. Download (pkglist): NuTyX_x86_64-11.0.iso (5,427MB), NuTyX_x86_64-20190325.iso (383MB).